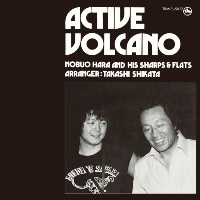 This big band album Active Volcano is performed by Nobuo Hara and His Sharps and Flats, but what is really featured here is the compositions and arrangements by Takashi Shikata. On this album, the young coomposer and arranger tried to incorporate new ideas and new sounds while respecting the tradition of big band jazz. The use of new rhythm figures and electric piano, as well as th e occasional use of overdubs to expand the sound palette are some of the new elements. From the powerful title track, a blues number featuring the trombone section to "Ondo" which is inspired by traditional Japanese music, the arrangements are creative and effective, and the performance by Japan's premier big band is superb. Produced by Takeshi Fujii. Recorded at Epicurus Studio in Tokyo on June 25 through 27, 1979. Blu-spec CD is compatible with all regular CD players. Paper sleeve special limited edition.